Now home I wanted to write a short note to give you an update on the day. Several hundred folks came by the church to pray, to talk, and to cry with their brothers and sisters in Christ. Many others texted, called, and emailed. Throughout the day the presence and comfort of the Lord was palpable. There is still much we do not know. We do not know how or what started the fire. Both SLED and the ATF were on the grounds today inspecting the site. Inspections of this sort are routine after a large fire. When they left they told us that it’d probably be late in the week before they could offer an assessment. We do not know when we will gain occupancy of the undamaged portions of the campus. Thanks to the exceptional work of the Mt. Pleasant Fire Department they were able to preserve the Historic Church unscathed. That old church building has survived a war and earthquakes and hurricanes. She is the wellspring out of which all that we have become over the past (almost) two centuries has emerged. And it is to her that we return as we regroup and by the grace of God, rebuild. The Ministry Center has sustained substantial damage. The Mt. Pleasant Fire Department returned it to our care this evening. Hill Construction has secured the building and we have off-duty Mt. Pleasant Police officers providing security. I have heard from numerous pastors throughout the Lowcountry and beyond. And I have heard numerous reports that many, many, worship services began with the various congregations interceeding for us. We are reminded, aren’t we, in times like this that no matter the name on the sign or the denomination affiliation we are one in Christ. I hope that you find as much comfort and encouragement as I did in these simple expressions of concern and offers of prayer that poured in from so many. The recurring question of the day has been, “what can I do?” I love that about our church family; everyone willing to jump in and do what they can. Because a fire of this magnitude is beyond a pick-up clean-up crew we are working with our insurance agency about specific next steps. I need your prayers for wisdom. Over the next few days we have to sort out some very practical matters. We need space for our weekly staff meetings. We need office space. We need to have electricity restored to the undamaged part of our campus. We need to sort weekend worship schedules. Most importantly, we need to rally to one another and to the Lord who will surely lead us in the weeks ahead. Let me close with a picture that one of our members took with his drone at the end of the day. Amidst the ruin of our beloved sanctuary you will see standing the emblem of our faith, the cross of Jesus Christ. 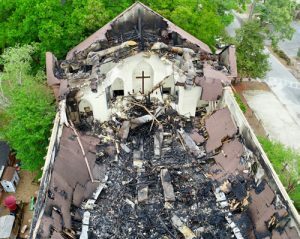 That wooden cross was at the epicenter of the fire – and it still stands! I believe with every fiber of my being that what the enemy meant for ill the Lord will redeem for His Kingdom purposes in ways that will surprise and delight us. We – you and I – are the church and the Lord dwells within us and among us, He will surely lead us higher up and further in. Our social channels are continuously updated. You may also sign up for our email distribution list via the email icon below.